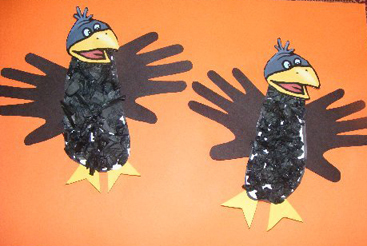 Trace your child's handprint and footprint onto black construction paper. to the footprint. Glue on the wings (handprints), head and feet to the back of the footprint pattern. It is fun to make a real like scarecrow out of kids and adult clothing. up pieces of newspaper and stuff the scarecrow. This is a great strengthening activity and turn taking time. attach a ready made head with some hot glue or a grown ups sewing help. and use a candy holder pumpkin for the head. Use the hay and glue it to a scarecrow shape cut from construction paper. 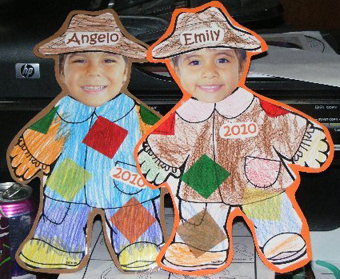 Give each child a scarecrow pattern to color and decorate. Cut the head off the pattern and add a photo of your child in its place. onto a piece of construction paper. Cut around the entire scarecrow. each side of the mask, so that it can be tied in back. per child. Put a piece of modeling clay in the bottom of each cup. cross to make the head. Allow to dry. Stick the scarecrow into the clay and fill your cup with raffia. from construction paper and attach it to the top of the paper plate face. Attach the face to the short end of a 9" by 12" sheet of construction paper. wallpaper. Attach four strips of crepe paper streamers to create arms and legs. Attach yarn to the top of the scarecrow and hang it from the ceiling. features, such as buttons, beads, fabric scraps, sponge, pompoms, rickrack, etc.